Sports Travel and Tours President Jay Smith is making sure baseball fans get every opportunity to engage retired American league and Major League Baseball umpire Al Clark, connecting Al to fans on the other side of the globe and expanding his “Ump’s Eye View” presentations for 2018. Thanks to Jay’s role in the last year as chairman of the National Tour Association, Al spent several days in April last year at an umpire clinic at the Yokosuka naval base, south of Tokyo, for United States special servicemen and the Japanese American Officials and Umpires Association. Since Al has been home, though, it’s been full speed ahead with Sports Travel and Tours. With 26 years of experience as an umpire, Al consistently tells hundreds of stories to fascinate devoted baseball fans, and he’s kicked off our trips across the country, including those in Cooperstown, New York, home of the National Baseball Hall of Fame and Museum. “I tell guests what to see in the cities they’re in, talk about the games they’re going to see, and the third team on the field—the umpires,” Al explains. 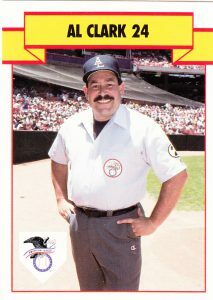 As part of this year’s Hall of Fame induction trips, Al will offer talks to small, private groups in addition to his standard, larger “Ump’s Eye View” presentations. For example, two years ago, when Ken Griffey Jr. was inducted, Al shared many stories about the Seattle Mariners center fielder. Al remembers how much Seattle natives adored him and his infectious smile, and he describes a chance encounter he had with Ken when they parked adjacent to one another at a game. Al says hearing such personal tales really endear the players to Sports Travel and Tours travelers, giving them a better perspective on the players they’re coming to see. Inductees for the Class of 2018 are: Trevor Hoffman, the All-star closer of the San Diego Padres; Jack Morris, one of the best post-season starters ever for the Detroit Tigers, Twins and Blue Jays; Alan Trammell, a shortstop form the Detroit Tigers; Chipper Jones, a former third baseman of the Atlanta Braves; Vladimir Guerrero, a power hitter and right fielder who played for the now-defunct Montréal Expos and the Los Angeles Angels; and first baseman Jim Thome of the Cleveland Indians as well as the Phillies, White Sox, and Twins. Al is already getting his stories ready, as he did last year when Iván Rodríguez, who has earned a soft spot in Al’s heart and is nicknamed “Pudge,” was inducted. In addition to his presence on our Hall of Fame induction packages, Al’s got a full schedule with our other trips this season. You’ll be able to find him and his program at our following packages: the East Coast Extravaganza, All-Star Plus, East Coast Classic Plus, San Diego Induction Plus, Induction Plus, and East Coast Express. He will also be on the Spring Training Cruise in 2019. Trips featuring his program will bear his logo in our 2018 brochure, and sign-ups online also list whether or not his program will make an appearance. Al’s presentations are one of the things that set our tours apart from others. Learn more about Sports Travel and Tours’ Hall of Fame travel packages, featuring presentations by Al.